Ever want to take a time machine back 100 years? We got that privilege when our neighbors gave us three large photo albums full of the history of our homestead. Above is a photo that came with the house taken sometime during the 1920s showing only the net shed, boathouse and small cabin where our guest house is today. Fish and pelts are drying on racks to the left. All that remains today is the engine of the boat beached below the cabin. Here is a photo of Frank Wyatt and the date 1960 written on the back. I’ve no clue who this person is–perhaps the former owner? 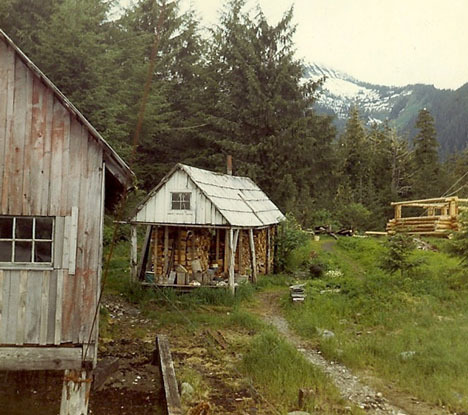 This photo is taken standing where the current log house is. Early newspaper accounts state this is the ‘old Garner property’ and later the Franz Gaff Hook Factory. It was first cleared in 1927. This is what the old house, woodshed and net shed looked like from a float 100 yards off our beach. This float is officially on the nautical charts and we use this feature to find our house in the winter in the fog using our GPS. Remember our aerial fly-by (see prior post)? Here’s one taken perhaps in the 1960s. Note the extensive gardens and the dead yellow cedar trees interspersed in the forest. There are none 50 years later; perhaps logged off for fuel. We do have some cedar groves up near the borders of the muskeg but they are dying back fast–thought to be the result of less snow which normally preserves the root system in winter. Global warming?? Here’s Harry, the former owner, laying the first course of the cabin we currently live in. He built the sauna first–July 1967 is inscribed in the cement floor. Harry had the foresight to lay the first course of logs in yellow cedar to prevent rot. The logs today are still in perfect condition. 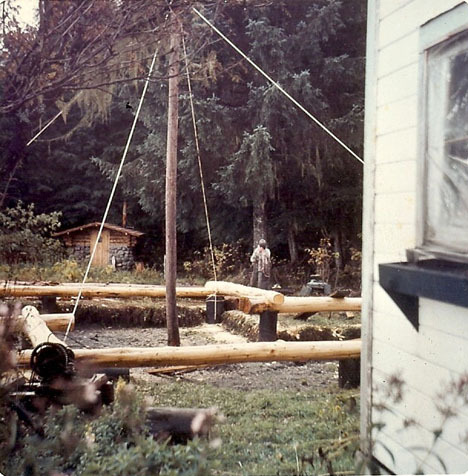 This photo is taken May 1969 showing both houses. Here is the original woodshed. Harry put in new pilings on the dock/net shed from where this photo is taken. Our boardwalk follows this original path, instead of under the eave of the netshed which is a huge avalanche problem in the winter. This entry was posted on Tuesday, July 21st, 2009 at 8:52 am	and is filed under Alaska. You can follow any responses to this entry through the RSS 2.0 feed. Both comments and pings are currently closed.